What now, for the Body of Jesus Christ in America? We require a booster shot which injects healing to the bones, LIFE to the soul, and fire to the spirit. Get yours! 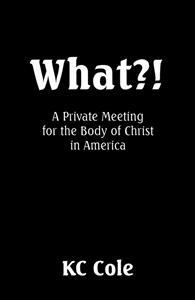 Question: Where do we stand as Christ’s Body, His Church in America, today? How did we get where we are, and why? What are we doing?! Does it matter? It is time for fire to illuminate what we are, whose we are, why we are, what we are to do, and how to do it. The Body of Christ in America needs a transfusion of truth. Now! It may be uncomfortable, but the power that flows is healing to the bones, fire to the soul, and LIFE to the spirit. I just finished reading both books (What?! & The "Truth"). Let me just say WOW! How incredible eye opening. Everything in them was just perfect. I have never heard these things explained in this way in any church or from anyone else I have talked to. It is a completely unique way of explanation that is simple and inspirational. I can think of several things I felt the need to highlight to study and memorize throughout reading these two books. Reading them a second time I only learned and understood more of what was being easily explained. I couldn't agree more with everything that was said. God has big plans!! I truly feel these books are blessed and anointed by God for His own special purpose. I can't wait to read the third one!